The Clinical Massage Therapist will have 2 years training plus CPD Hours. Clinical Canine Massage works by addressing the dog’s gross anatomy, (their bones and muscles) to bring about physiological change (the living systems and organs of the body) within the body. The aim is to reduce sympathetic activity within the body by addressing sensory neurons embedded in muscle, fascia and skin, leading to resolved or reduced pain and restoring normal muscular function and mobility. – Muscles, tendons and ligaments are manipulated to create space within the body. – The dog holds spasms, trigger points, myofascial pain and myalgia just like us. Nothing addresses soft tissue problems better than the soft tissue of another – machines and exercises are no substitute for practiced, informed touch. – The muscle strain is the most common muscular injury in dogs. It responds better and quicker to massage than any other therapy. – The whole body is connected; areas of overcompensation and imbalance are always addressed during a massage therapy session. 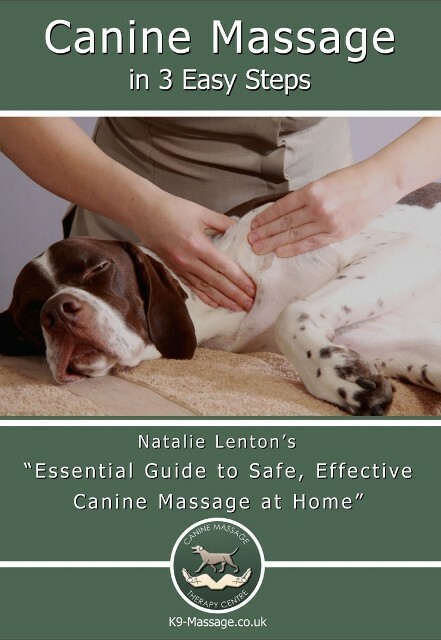 – Each massage is individual to the dog’s needs. There is no routine and a therapist is able to justify which techniques the dog needs to address their specific issue. – Massage improves circulation and reduces ischemia by releasing trigger points and relieving areas of congested muscle that have formed due to habitual patterns of tension and protective muscle splinting. – Clinical Canine Massage addresses superficial and deep fascia to inhibit nocicpetive pain activity and normalise fascia to improve muscular and somatosensory function. – Restores normal muscular tone and inhibits hypertonic muscle by addressing Golgi tendon organs and muscle spindles with specific techniques. – Clinical Canine Massage therapists understand when the dog needs to be referred back to the vet or when another therapy may be more suitable. – A maximum of 3-4 initial sessions although some dogs need less.